If you know me, you know I’m into vegetables. I’ll often fill an entire plate with veggies at the dining hall–for me, choosing between carrots and broccoli is like choosing a favorite child. I just can’t. Because of this, eating in Spain has been immensely frustrating. Spaniards hardly eat vegetables; their occasional vegetable consumption consists of “salads” composed of a lettuce leaf and two tomato slices (if you’re lucky, you’ll get a cucumber slice or a spoonful of corn). This entire trip has been a neverending quest for some green to add to our all-white plates. Tonight we hit the jackpot: we ordered the ensalada queso de cabra, which ended up being the most amazing salad I’ve ever had. For starters, it was gorgeous. The restaurant serves all of their salads in this stacked style, which downplays how much food you’re actually getting. 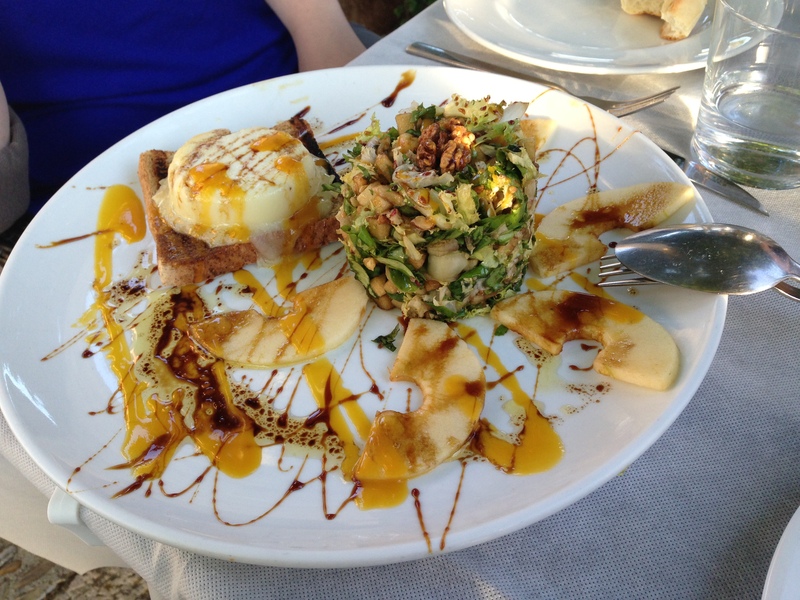 The stack combined the richness of walnuts with the sweet crunch of apples to balance out the sharp, creamy goat cheese. The whole thing was drizzled with a light balsamic vinegar and a mango puree, a subtle fruity twist on typical salad dressing. Absolutely delicious, and it was exactly the break I needed from wimpy Spanish excuses for vegetables. This post is inspired by the heavenly ensalada queso de cabra in Ronda, Spain (of course), and also Suzie 81 Speaks’ Weekly Word Challenge: Food.